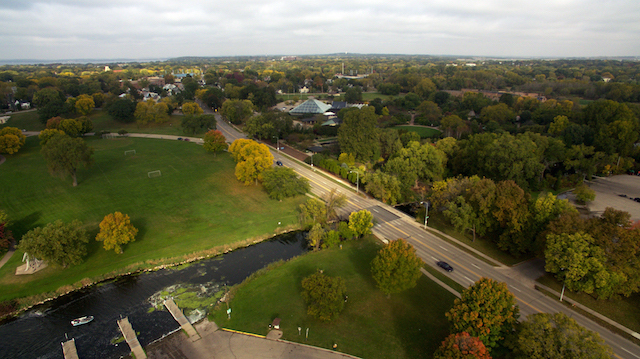 Looking West along Atwood Ave. toward Olbrich Botanical Gardens with Starkweather Creek in the foreground. A planned reconstruction project for Madison's Atwood Avenue has sparked conversation among East Side residents, who see the initiative as an opportunity to improve safety conditions for pedestrians and cyclists. The project, a joint effort between the City of Madison and the City of Monona, would rework a 1.3-mile stretch of Atwood Avenue running from Fair Oaks Avenue to Cottage Grove Road. With an $8 million budget, the reconstruction aims to improve safety and traffic conditions for the avenue, particularly in the area running along Olbrich Park. While project elements such as a complete reconstruction of the Atwood Avenue–Walter Street intersection aim to serve the Avenue's estimated 14,000 daily motorists, community members are advocating for more consideration of multimodal transportation. A major component of the preliminary plan is the addition of a multi-use path for pedestrians and cyclists. Running along the south side of Atwood, the path would vary from 8 to 10 feet in width, and would receive its own pedestrian bridge across Starkweather Creek. This multimodal path would give pedestrian and bicycle traffic a better alternative to Atwood Avenue, where many neighbors believe traffic is too fast to be manageable. India Viola, a resident of the Atwood neighborhood, is eager for safer alternatives. “I moved into this neighborhood nine years ago. I drive a car, I bike and I walk, and Atwood Avenue has always been a stretch that’s felt dangerous by any mode of transportation," Viola said. "I’m really interested to see it get designed intuitively so that people driving cars want to slow down so that people who are biking and walking can use this area safely. Right now it’s like crossing a highway." Atwood Avenue divides a busy recreational area, with Olbrich Park and beach on the lake side, with Olbrich Botanical Gardens and sports fields on the opposite. Presently, this stretch of Atwood lacks any designated pedestrian crossing zones – a major impediment to local residents trying to make use of the area. Carol Nickles has lived in the neighborhood for 27 years, and has always recognized Atwood Avenue as a problem. “I’ve raised my kids here, and there’s lots of safety issues with crossing Atwood Avenue, for myself and for families," Nickles said. “I walk across the street almost every day to go for a walk by the lake. That’s my time to decompress from work, and I’ve been doing that for years, but it just always feels like a race." The proposed plan would add a number of Rectangular Rapid Flash Beacons (RRFB) along the Avenue, solar-powered LED blinkers that increase visibility for pedestrians at unsignalized crossings. According to the Federal Highway Administration, adding these beacons along a roadway increased instances of motorists stopping for pedestrians from 18 percent to 81 percent. Critiques of the proposed plan include the accusation that a bike path along Atwood Avenue would be redundant because of the nearby Capital City Trail. Jeff Fitzgerald, a resident of the area and owner of Revolution Cycles on Atwood Avenue, argues that a bike path along Atwood would provide a faster, more commuter-focused alternative to the trail. In addition to pedestrian crossings and the multi-use path, the current proposal would replace the pavement, curb, gutter and sidewalks along Atwood Avenue, add new lighting, replace storm sewers and water mains along the road, add designated parking lanes, and potentially replace the signal intersection at Atwood Avenue and Walter Street with a roundabout. Chris Petykowski, Principal Engineer for the City of Madison, expects to receive federal funding for the project that would cover 60 percent of the $8 million cost. However, during an October 4th public information meeting at Olbrich Botanical Gardens, local attendees voiced concerns that the current project didn't focus on the right issues facing the community. The October 4th meeting was the first opportunity for neighbors to offer input on the proposed plan. Petykowski acknowledges that community input may shift the focus of the project. The project aims to complete a preliminary design by spring 2018, finalize the design by fall 2020 and begin construction in spring 2021. Petykowski suggested that another community meeting will be scheduled for summer 2018 to provide another opportunity for neighbors to offer their input on the project proposal. The Madison Community Foundation announced an $84,200 grant last week which aims to expand bicycle access to Madison residents and increase community education on bicycle maintenance and safety. Called ‘Mad About Bikes,’ the grant aims to fund local bicycle charities and recruit volunteers to help expand community access to Madison’s bicycle infrastructure.